Many congratulations to NCLC donor Katie Davis, for her well-deserved School Library Journal Trailee Award given annually at the American Library Association’s Midwinter Conference for the video trailers that best promote books for children and teens. “Book trailers raise awareness about the big power of little books to reach readers,” said Davis after learning that she had won. Davis, who also illustrated the book that she co-authored with her husband Jerry Davis, thanked “all those nice little chickens (and people!) who voted” for her entry. In the category of Publisher/Author Created for Elementary Readers , the trailer tells the story of Little Chicken’s Big Day, when Little Chicken goes with his mother to do errands and gets lost. The School Library Journal web site has more information about the Trailee Awards including winners in other categories, such as Grace Lin’s Award in the Student Created for Elementary Readers category for Where the Mountain Meets the Moon (Little, Brown, 2009; Trailer by the members of the Bookie Woogie Book Blog). Grace Lin appeared at the 2011 Connecticut Children’s Book Fair and we hope to see her again soon. Congratulations, Katie and Grace! 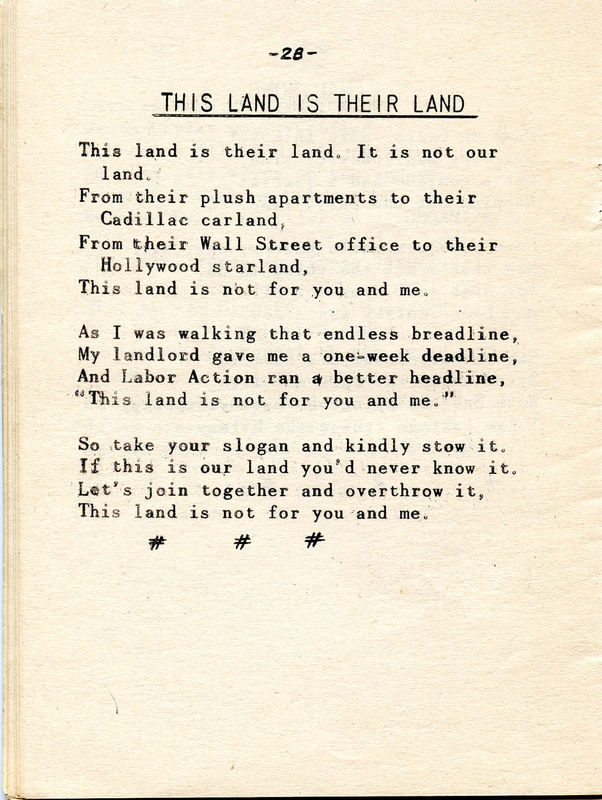 Satirical lyrics for "This Land is Their Land"
There is no published date for the book but from some lyrics it appears that it was published in 1947. The lyrics in the booklet are highly satirical of the conflict between those in power, both polititians and others in control by virtue of wealth or ownership of businesses, and workers. The lyrics are very bitter to those who own Cadillacs (a very fancy and expensive car, especially in the 1940s), are landlords, are on Wall Street and in Hollywood, as in the song “This Land is Their Land,” or to the President (at that time Harry S Truman), implying that he is playing golf while workers suffer, as in the song “The Right to Suffer Blues.” Burning Tree is a reference to an exclusive golf club in Greenwich, Connecticut. There are references to publications of the Communist Party, including The Daily Worker, and the Socialist Workers Party, who published Labor Action. The lyrics to “The Right to Suffer Blues” has an interesting play on the word “putts,” with a note to those who speak Yiddish that it means “to hit the ball.” It actually is a tongue-in-cheek reference to the Yiddish word “putz,” which means a stupid person. This primary source conforms to the Connecticut Social Studies Curriculum Framework for high school students, particularly Strand 1.1, grade level expectation 7 — compare and contrast various American Beliefs, values and political ideologies. Who may have written these lyrics? Do you really think it was people who were someone’s bosses? What year was this booklet created? What was happening in the world at that time? Is this written as a satire or do you think the writers meant for the reader to take them at face value? Who do you think the audience for these lyrics was? What change do you think the writers of the lyrics hoped would take place? Who is J. Edgar Hoover and why would the songbook be dedicated to him? In the song “The Good Old Party Line” there are references to “’41,” “Willow Run,” and “Chiang Kai Chek.” What do these mean? I will add some information about the booklet in a post in a few days. In the meantime, analyze this document and ask a lot of questions of it. Let me know if you have other questions, or what your comments may be. Many students had already gone home, so as of January 18, 1916, Connecticut Agricultural College suspended classes until February 2. Then, on January 30, the suspension of classes was extended, and the college would not reopen before February 9. It was determined that final exams would not be given for the winter term – the college was then operating under a system of three semesters. Final grades for the semester were based on a student’s class average, and anyone who had a 60 or below (out of 80), could take what was called “a free condition exam”. More than 1200 cases of scarlet fever were reported in Connecticut in 1916. Twenty nine resulted in death. It’s hard to gauge just how high the Lyman Viaduct is until you click on the photograph to get a larger view and look closely at the bottom. See the man and the horse (or maybe it’s a mule, it’s hard to tell)? Then compare them to the enormity of the trestle, then under construction. Amazing, isn’t it? 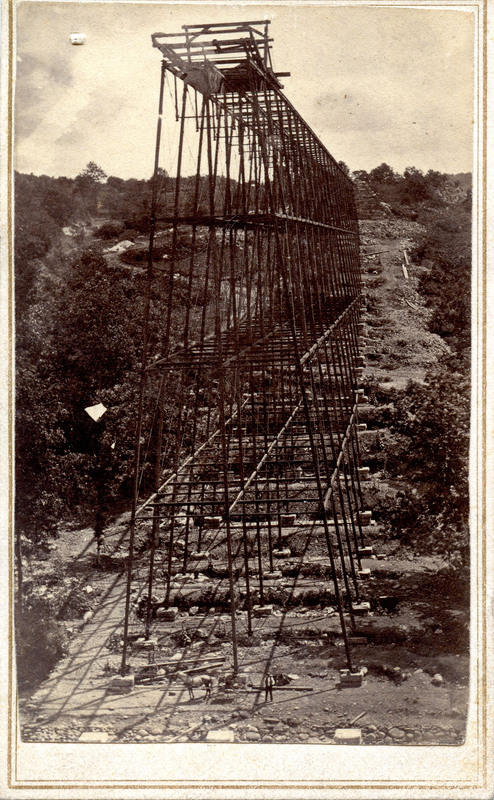 At 1100 feet long and 137 feet high, the Lyman Viaduct iron railroad trestle was built 1872-1873 to span the valley of Dickinson Creek near Colchester, Connecticut. Named after David Lyman, the man who built the New Haven, Middletown & Willimantic section of the Air Line Railroad, the trestle was a major link in a railroad line that was billed as the fastest route between Boston and New York City. In 1912, as trains became heavier and the railroad became concerned about the stability of the trestle, the Lyman Viaduct was filled in with sand and gravel. It is now part of the Air Line State Park Trail, on the Rails-to-Trails network. It was added to the National Register of Historic Places in August 1986. The Lyman Viaduct is a technological marvel, showing the great lengths Americans went to to take advantage of the most powerful mode of transportation of the time. By the early 1900s almost every town in Connecticut had a railroad line easily accessible, enabling travel among the towns and cities as well as across the nation. This primary source conforms to the Connecticut Social Studies Curriculum Framework for Grade 8 students, particularly Strand 1.5 — weigh the impact of America’s Industrial Revolution, industrialization and urbanization on the environment.